This lightweight knitted cardigan is a classic. The crochet effect around the neck, along the placket, and on the cuff adds to the uniqueness of this beautiful garment. As this is made from natural fibres it keeps you cool during the summer. 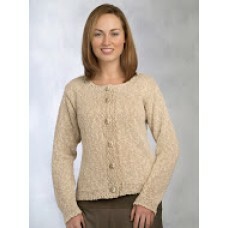 The yarn used is a special bouclé yarn giving the plain stitching added character. This is available in a range of colours and sizes.